On February 15th 2015 six guys set out at 6am in the morning to take on a ‘Round the Island’ cycle challenge in Singapore. The objective of the 126km ride was to raise awareness for ‘Thinking of Oscar’ and show that you can do anything given a group of like minded individuals who all wanted to do something to support our cause. 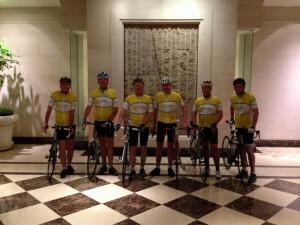 The ride was organised by our good friend Jeremy Budd and we flew out to Singapore so that David could also take part. The plan was to start early to try and avoid some of the 35 degree heat and 70-80% humidity, beginning at Ion Orchard and finishing at the Singapore Cricket Club. Friends and families met the cyclists along to way to replenish water and then again to have a light lunch around the 110km mark where they then picked up a few of the children to cycle the final 15kms or so to the SCC. 2 blooded knees (one sustained the day before and both to David), only one puncture, 128kms (slightly more than planned due to a couple of map reading errors) and 6 new life long cycling buddies later they all arrived safe and sound at the Singapore Cricket Club for some very well deserved refreshment. Thank you to Jeremy, Nate, Mike, Marc and Arthur (Hans and Andy) and of course to your families for all of your support on the day and subsequently.